Facts have come to light pointing towards how the Maharashtra Forest Department has moved quickly to "implement" a High Court order, removing slum "encroachments" off Mumbai coast on forest land, while summarily ignoring several other big buildings adjacent to the mangroves that existed in the same area, built after October 6, 2005. According to the Ghar Bachao Ghar Banao Andolan (GBGBA), which is spearheading to the struggle of slum-dwellers' housing rights, the targets were the so-called "informal settlements" in Malvani No 8, Malad. These were demolished on June 4 and 6 this year in the name of "protecting mangroves". In all 600 houses were demolished. Carried out by the the Mangroves Cell of the Maharashtra Forest Department, it had submitted before the High Court that land within 50 meters from the mangroves land would be declared "protected", and no construction activity would be permitted after October 6, 2005. Led by well-known social activist Medha Patkar, GBGBA has said in a statement, "Shack dwellers of Malavni No 8 have been living in that area pre 1995, 1997 and so on. Adjacent to their settlement, there lies a park whose boundaries appear to have been extended 2015 from what was there in 2005." It adds, "The distance between the pole erected by forest department and the boundary of the park is certainly less than 50 metres and still the construction is allowed to take place." 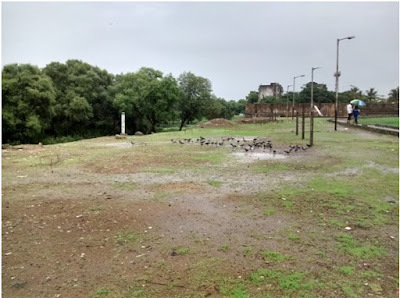 It further points out, "Just adjacent to the park is another area which belongs to the Maharashtra Housing and Area Development Authority (MHADA), as per the description on the board erected on the land by the authority. The pillar that was erected by the forest department is broken. The area is lying vacant as of now and a part of it is being used as a dumping ground." GBGBA adds, "The year 2005 Google earth map shows that no structure was there in that year on the land of MHADA and part of it was covered by mangroves", while in the year 2015 "on that very land of MHADA there seen tall buildings and the part where mangroves used to be there in the year 2005, seen cleared and filled with debris." GBGBA castigates the Mangroves Protection Cell for ignoring "all the above cases, and have their bulldozers clear houses of the poor just adjacent to these structures." 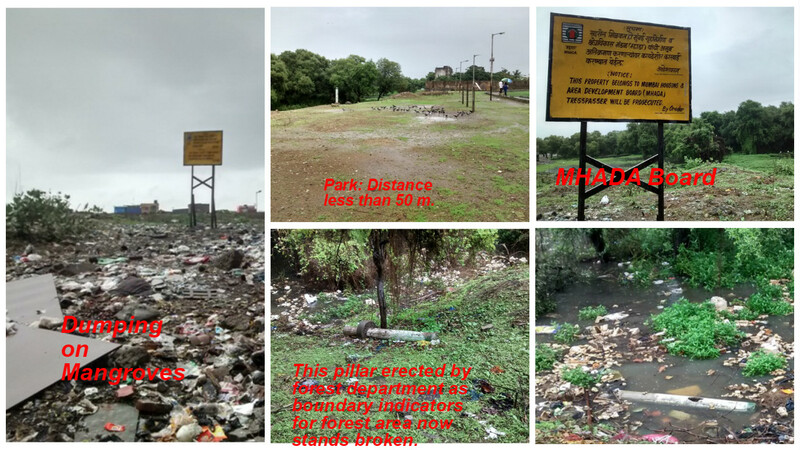 Meanwhile, the collector, Mumbai Suburban District, who chairs the District Coastal Zone Monitoring Committee, has submitted a report which highlight big structures that came after the year 2005 on the mangroves land. Yet, says GBGBA says,"three months have passed, neither any action taken by the collector not any response received to this report till date." It says, "The question is, where will these shack dwellers go and live? Given their poverty, they cannot afford to buy a house in city like Mumbai. If they rent a house, it will consume all their earnings." "Doesn’t the government have the responsibility to think about this section of the society which comprises more than 50% population of the city, whose hard work make the city functioning, before spending Rs 432 crores on a park or Rs 12,000 crores on coastal road? ", it asks.